At first it just meant, to me, that I was going wandering. Aboriginals in Australia go Walkabout and they follow the songlines. The Songlines have been there ever since the ancestors sang the world into existence during the Dreamtime. I’ve always been one to appreciate a good creation myth thanks to my early fascination with Joseph Campbell. Singing the land into existence? Wow, that’s beautiful. And powerful. So off I go on my Walkabout. It’s nearly two months ago now, that I left. Telling myself I’m following the songlines. MY songlines. There’s something tricky about following the songlines. Most especially because I’m not completely sure what I mean by that. Be it etched in the land, or etched in my own psyche, I just know that there is a path out here. Through this country. For me. And maybe (likely) it’d be a different path at a different time, but right now there is a very specific path. There’s a story. Of the now. And I need to find it and follow it. I’m trying very hard to do just that. Sometimes it’s about something to experience or a place to be. Sometimes it’s about someone to meet or a friend to see at just the right time. Sometimes it’s about a particular road to travel. Sometimes I lose the songlines. Or I think I do. I struggle at times with exactly where to go and what to do. There are things and places and people I want to see but what if the songlines don’t go that way? Some mornings I make up my mind on the direction to go, then I get out on the road and go a completely different way. This happened in Atlanta. I thought, from there, that I was headed to visit my best friend’s parents and then I was going to Birmingham. But then the songlines pulled me north, into Tennessee. I went with it. This happened also when I was in Dallas. I had determined all along to visit Austin on my westward journey. But I stayed in Dallas longer than planned and then the songlines dragged me west to Las Cruces for Xmas Eve. Literally, I woke planning to head for Austin, but got on the road and went west instead of south. It happened again as I was leaving Las Cruces. I wanted to go to Tucson. 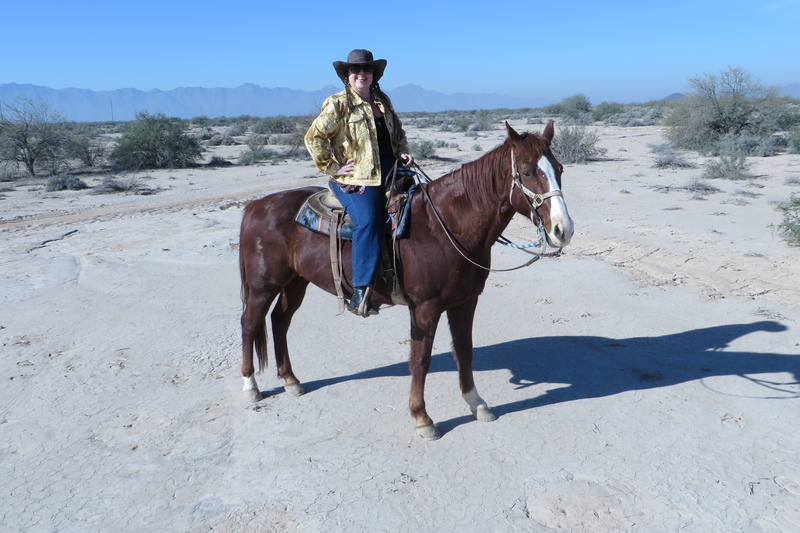 I’d been feeling the pull of the Sonoran Desert since before the journey began. But then a friend in Albuquerque was going on vacation and offered me his apartment while he was gone. This sounded ideal. 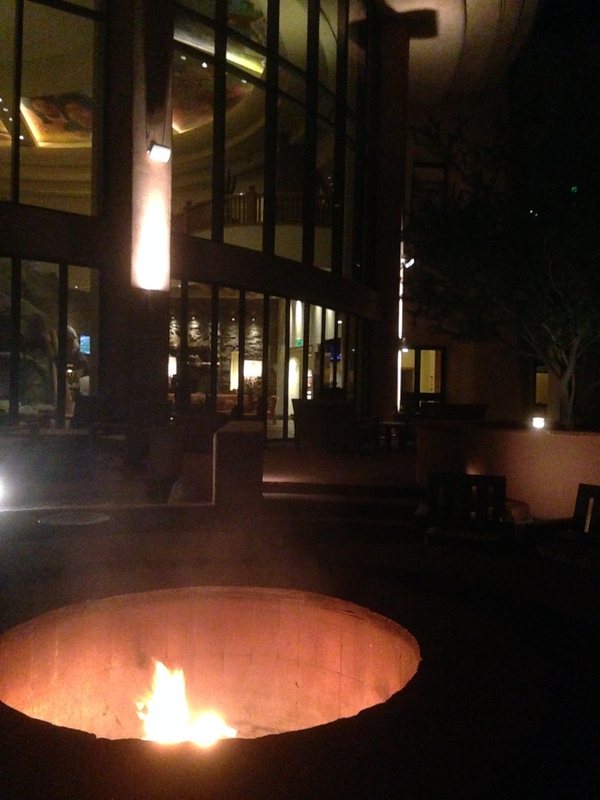 So I forced myself north to Albuquerque, but when I got there I felt it in my whole being – no. no. no. This is wrong. wrong. wrong. 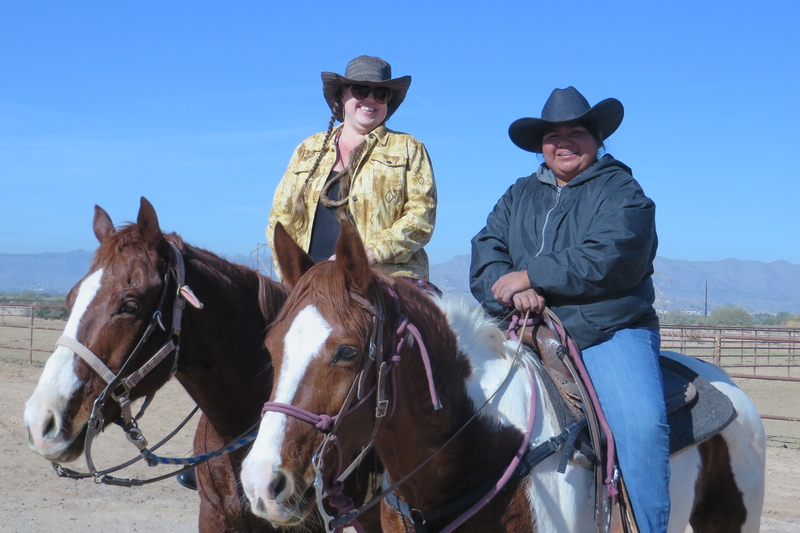 I knew I’d veered from my songlines so I had dinner with said friend, brought him to the airport at 5am and high-tailed it to Tucson to reunite with my path. “Just now, around noon on January 7th I’ve pulled over in order to type this. I left Scottsdale yesterday sure that I was headed for San Diego directly. I still think I’m headed there. Just not so directly. I thought I was headed for Yuma when I left. But no. The songlines steered my car to Blythe. I didn’t know why until I woke this morning. I knew I was headed towards the Salton Sea. And this road! It’s wonderful. Two lanes. 65 mph. I am mostly alone rolling through the desert. At first it zoomed through fields that the great majority of America’s veggies come from this time of year. Then came the small mountains – the road winds through and around them in glorious sweeping curves. And the desert here is lovely. The road swims through dips. Up and down. Up and down. Up and down. So much fun to cruise along. 65 mph. The sun. The sand. The scrub. Me. My car. The land. The day. This country. This lifetime. And where I’ve just stopped, ahead of me are sand dunes. The Imperial Sand Dune Recreation Area. And I’m gonna start driving again. And I’m gonna pull over somewhere and take a walk in the sand because that is where I am, and that is why I am here. So a few weeks ago I was clearly still on my songlines. Or at least I felt like I was. I’ve been pondering this the past few days and have come to some conclusions. Northern California and the Northwest really isn’t (aren’t?) part of my songlines this time around. Well. I suppose that’s not completely true, since, here I am. It’s more of a nostalgia trip up here. I knew this. Knew it before I left. But I’d spent so much time out here in my younger days. There are so many people I love out here that I haven’t seen in 20 years and more. San Diego was definitely part of the lines. I’d spent two days there when I was 17 and didn’t feel that counted as really having been to San Diego. And I had to go to Riverside and find Tony’s grave. That was a part of the songlines too. But from there it gets a little cloudy. I was lured ever onward by tricks and trails of the heart. I considered not exploring California this time around but there were people I REALLY wanted to see. So I figured I’d go to Laguna Beach. Either way, I needed a dose of the sunny pacific. There I would stop a few days and think. And consider if I was indeed going north. And since I was this close I simply HAD to go in to LA. Some of my favorite people have four new girls since I saw them last and I want to know who these girls are as people. That’s important to me. Especially since I’m this close. 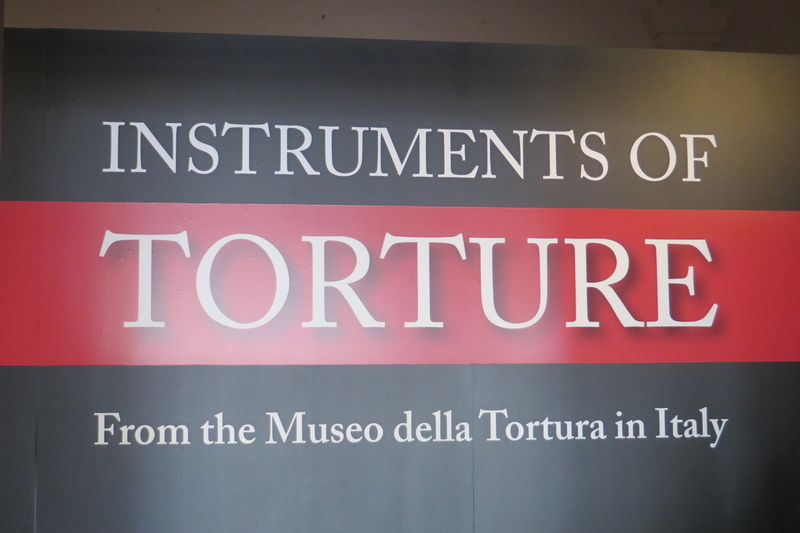 And in LA there are some museums I would love to visit. So I went to LA. One of my best friends in the world recently bought a house in Vallejo. I’d really like to see him and his new house and he really wants me to visit and smile at his choices. So I went to Vallejo. I wanted to. Now. Once I’m in the Bay Area there are so many people to visit. But I’m off the songlines and I know it. I can turn back soon. I’ll just go visit my friends in Novato and have a night at Terrapin Crossroads. I mean. Since I’m this close. I would be silly not to do that much. And there’s a bunch of friends in Santa Rosa. And some of my Oregon people are in Santa Rosa for the weekend too. It would be crazy not to go there for dinner. Especially since I’m this close. Do you see what keeps happening? And those who live in the mountain towns of northern California off 101. It’s only a couple more hours. And how lovely it would be to drive those vistas. I’ll go for dinner and a mini-reunion. It will be fun and I’ll get to see people that I haven’t seen in forever, children that are grown and starting their own families, towns that used to be so familiar to me. I had a wonderful dinner with old friends. 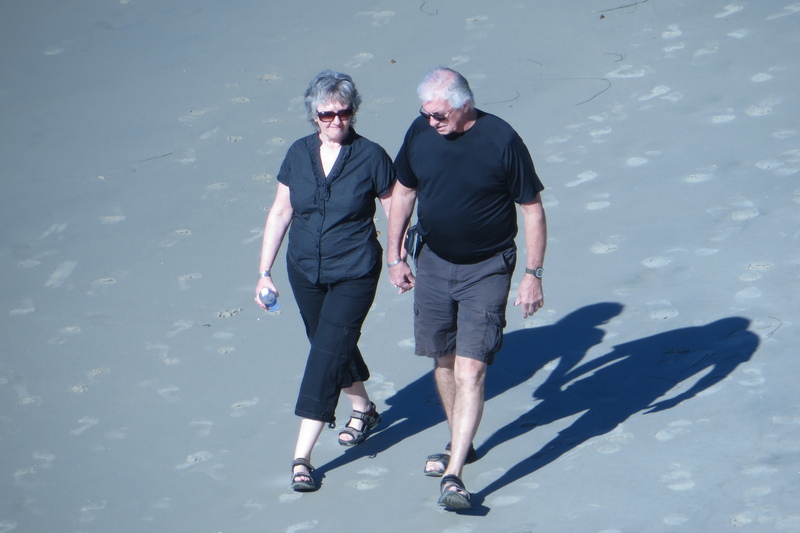 As I drove north from Redway, towards the Oregon Coast my mind and heart were stressed – what am I doing? What am I doing? What the hell am I doing? Why do I just keep moving north? I should get to the border of CA and just turn around and head back south till I can find the songlines again. But that would be crazy – I’m really not so far from Seattle and all the people I love and would love to see in Seattle, Portland, Eugene. Some are very close friends and some are weak connections with a beautiful chance to strengthen relationships. Turn acquaintances into friends. Yes? This kind of thing is what life is all about. I want to know these people better. And if I turn around now, I might never get the chance. And I’ve been trying to figure how I can squish everyone in as quickly as possible; see everyone and move on. ASAP. My friend, on the phone the other night, said that I’ve seemed slightly annoyed ever since I left LA. Not that I’ve consciously felt it, but he might be right. There has, perhaps, been some resentment in my soul that I’ve left and/or lost the songlines. And I told one of my favorite people in the world (She’s in Seattle!) that I was feeling squished and rushed and like my dance card was over-full. And she said that if I didn’t have time for her, she understood. But I should tell her where I will be and she’ll drive to see me. “I’ll drive 100 miles for a hug.” She said. I am on a most fabulous adventure. And if I’ve veered from the songlines I imagined, so be it. I am exactly where I’m supposed to be. Songlines or no songlines. I chose to travel this road so I could visit with people who make my heart smile. I am in no hurry. So what if I take longer to get home. What’s home? Right now it’s not about that. I do not ever wish to forget this northwestern song. It’s about people and relationships and if I think I’m off my path I’m likely wrong. The thoughts that I am off my path are about me not living in the moment. And that, right there, is the crazy part. Seattle, Portland, Eugene, here I come. 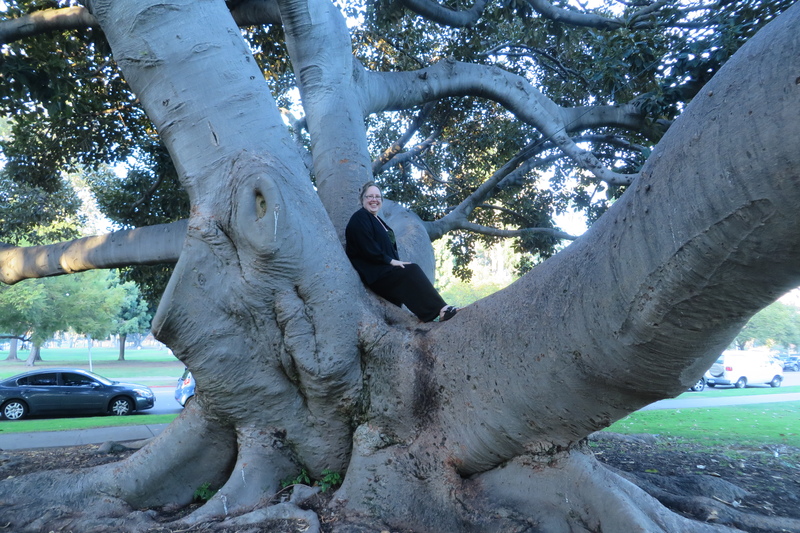 I fell in love with a tree in Balboa Park. One of my dearest friends, who happens to be a gay guy, had told me I should aim for the Hillcrest neighborhood because it is artsy and cool. 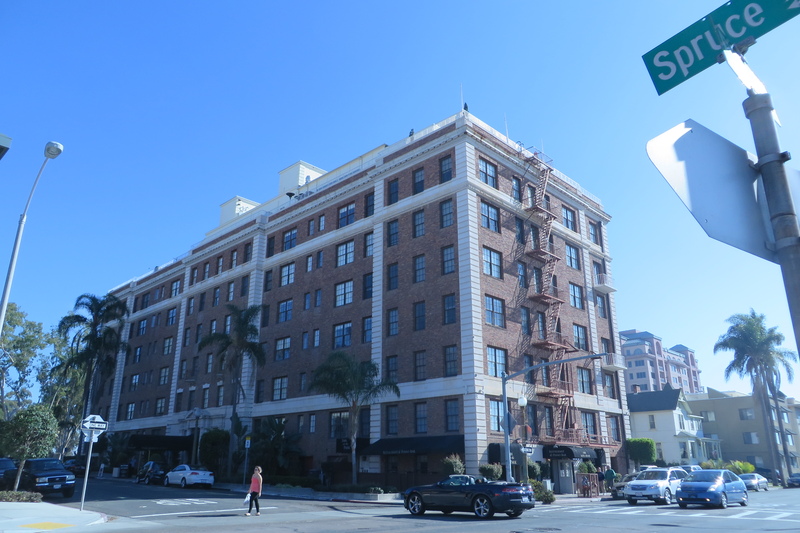 I didn’t much give any thought to his sexually oriented perspective, but this information landed me at what the concierge told me was the gayest hotel in “San Diego’s best gayborhood.” It was also a short walk to everything I wanted to see in Balboa Park. So I checked in. From the outside it’s just a rather large brick building, looking like any old nondescript apartment building. 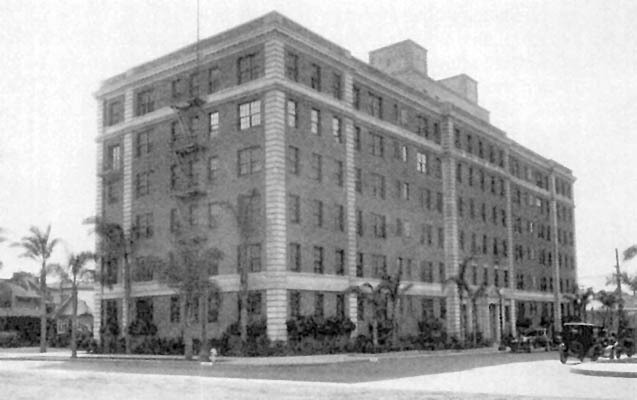 Apparently that’s a deserved look as the place started out in 1926 as a luxury hotel and apartment building called Park Manor Suites. It was designed by Frank P. Allen Jr. who was quite the impressive architect. 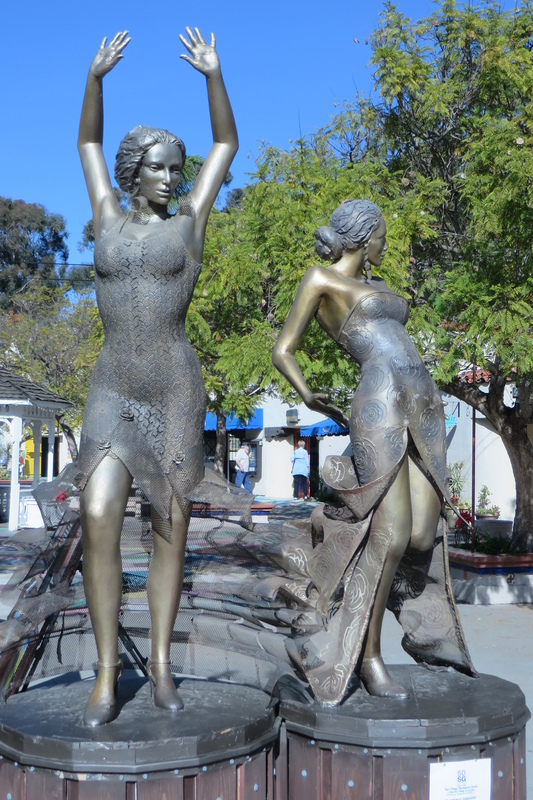 “Frank P. Allen, Jr., came to San Diego in 1911 to work on the Panama-California Exposition and left an indelible imprint on the architecture and landscape of the city. By profession, he labored as an architect, contractor, and engineer, as well as a sensitive self-taught landscape designer. Born in Grand Rapids, Michigan, in 1881 to Frank P. and Mary Allen, Allen received early training in the architectural field under the tutelage of his father, a Michigan architect. In his early twenties, after a stint in the Spanish-American War, Allen and his father practiced architecture in Grand Rapids under the firm name of Frank P. Allen & Son. Allen moved to Chicago in the early 1900s where he worked as a draftsman. He left Chicago in 1904 and headed west. He received a contract for the nine-story Perry Hotel in Portland, Oregon and completed it in unheard of time-two months and two days. He served as consulting engineer to Portland’s Lewis and Clark Exposition, held in 1905. His accomplishments in Portland led to his employment as the Director of Works for the Seattle exposition which opened in 1909. Seattle wanted “a man who could work fast and save.” Allen was given two and one half years to complete his portion of the work for the exposition. He finished it in one year and ten months. 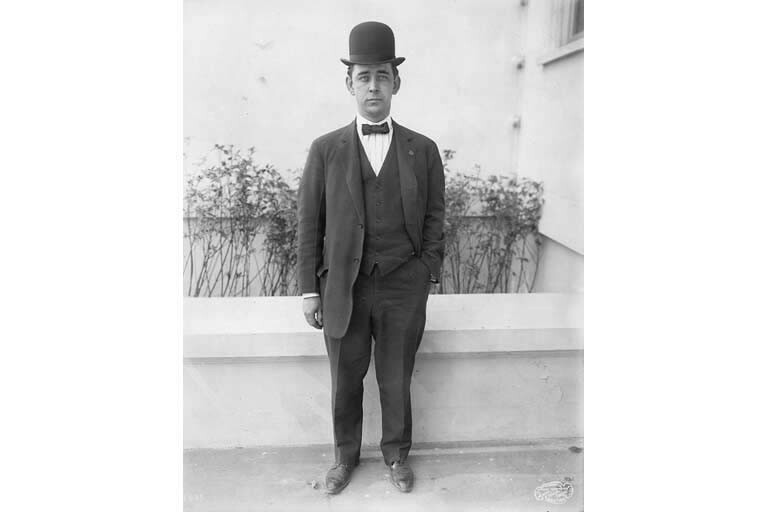 Allen was hired as the Director of Works in San Diego for the Panama-California Exposition in January 1911. His first order of business involved the topographical survey of the area which he felt needed to be completed. Allen found fault with the Olmsted recommendation of an exposition set along the Florida canyon site and proposed the actual site, “pointing out its advantages from a scenic point of view.” But exposition directors fought him, arguing “it would be impractical to build a bridge over the Cabrillo canyon, that the cost would be too great.” Allen demonstrated that his plans would be cost-effective, and in the end he won his battle. Allen “volunteered to shoulder the responsibility” for the exposition planting. 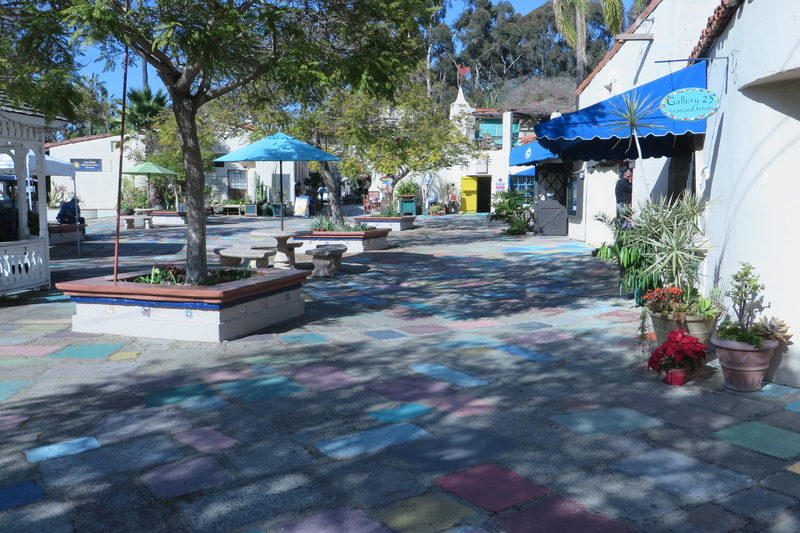 He implemented an irrigation system for Balboa Park and devised a landscaping plan. The Cabrillo Bridge, built of reinforced concrete at a cost of $225,154, extended 916 feet across the canyon. With great ceremony, the bridge was dedicated April 12, 1914, and the first person to ride across it was Franklin D. Roosevelt, then Assistant Secretary of the Navy. 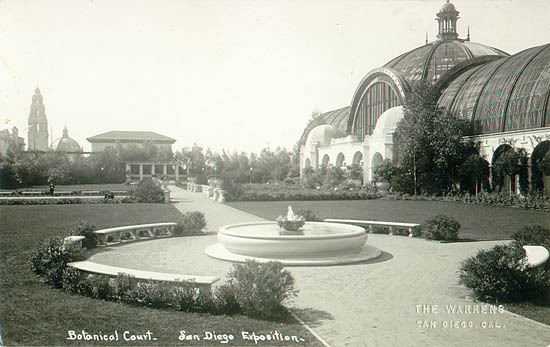 Allen contributed his architectural, engineering, and horticultural expertise to a number of other Balboa Park and exposition designs. I’m unsure when the name changed to Inn at the Park but that’s rather irrelevant, yes? The canopy over the front door still reads Park Manor Suites, so I suspect it wasn’t that long ago. 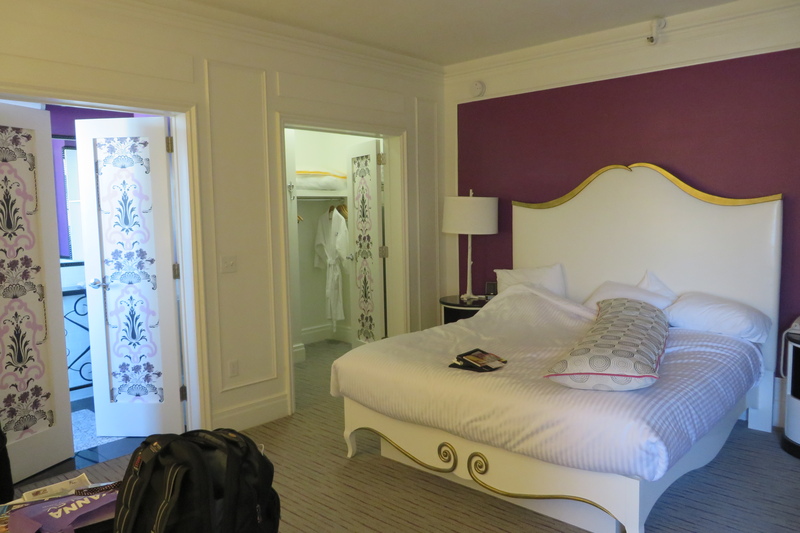 The room I had was HUGE. I’m told each and every room is different. 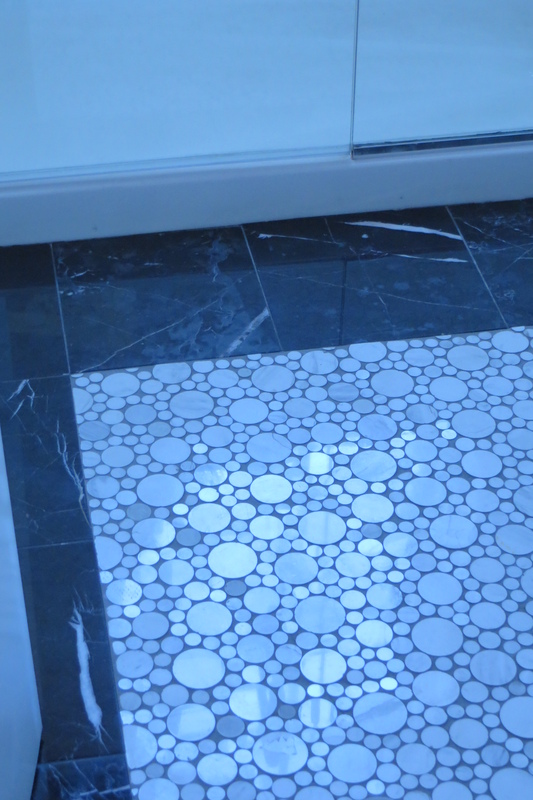 Mine had a large purple bathroom with a circular inlaid marble design on the floor. It also had a small but complete cooking area attached to a dining room with a stylish retro kitchen table. Opposite the massive and comfortable bed (with quality linens) was a large comfortable couch and an equally large glass deco coffee table. 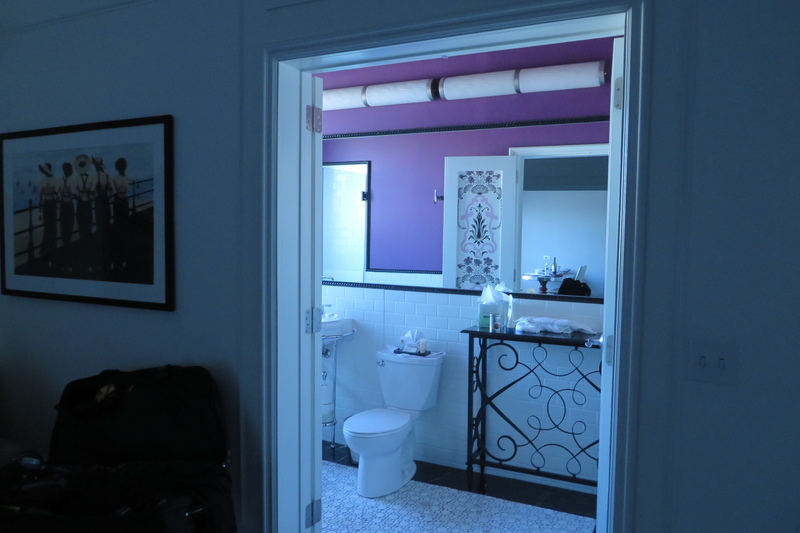 The closet was as big as the bathroom and both closet and bathroom had french doors stenciled with black and purple designs on the door’s inner panels. The whole color scheme was grey, purple, white and black. The art brought in splashes of yellow. It really was a joy to behold. 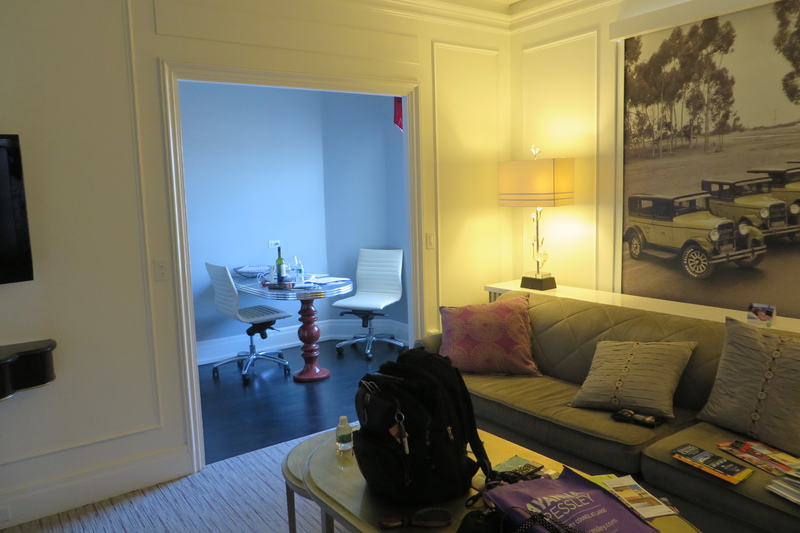 That said, when I first arrived I was conflicted and experiencing a love-hate relationship with the hotel. The only elevator was old enough that I would believe it if you told me it was original to the hotel. The hallways were kind of musty and smelled like a grandmother’s house. The Piano Bar downstairs was dark in a grungy way as opposed to dark in a pleasing way. I didn’t want to eat downstairs as it looked like only the most awful tasting food could possibly come from such a room. I do not know if that impression was correct. I never ate in that bar/restaurant. Instead I ventured out into the surrounding blocks for my nighttime eating. That first night I went to sleep considering that I might leave in the morning. In the morning however, I was introduced to the true gem of this hotel. The roof top restaurant. It’s only open for breakfast and lunch as far as food goes, but it becomes a bar on Friday nights – but more on that in a moment. The views of the city and the park in the brilliant sunshine, and the planes landing at San Diego airport, skimming by so close you could practically reach out and touch them were truly glorious things to experience with my morning coffee. 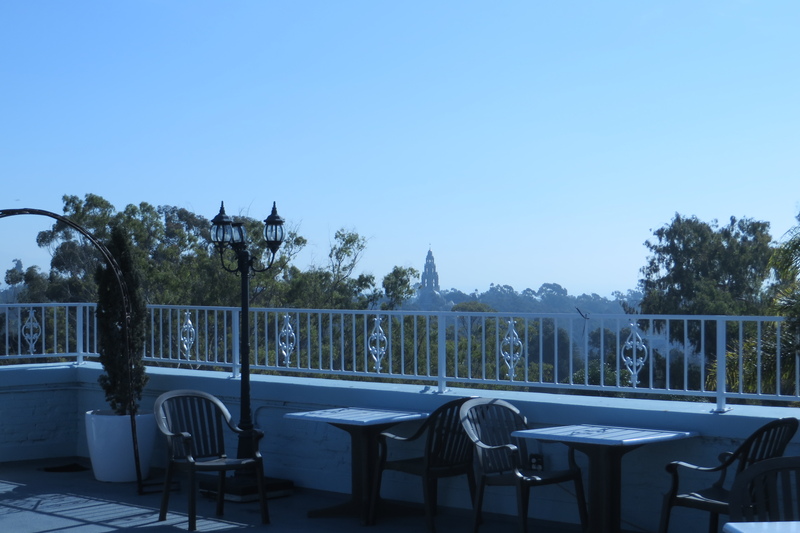 So – coffee on the roof and the days spent walking through the park convinced me to stay. My second day there was Friday. When I returned from the park my concierge friend told me there was a Friday happy hour on the roof. He totally warned me it was mostly gay men who attend. Mostly! Ha! If there was 3% women there I’d be surprised. And if more than .02% of them were straight I’d be even more surprised. I met interesting men and their husbands. I met bankers and lawyers and broken hearts. And they were all in the 40-60 age range it seemed, so I appreciated that. 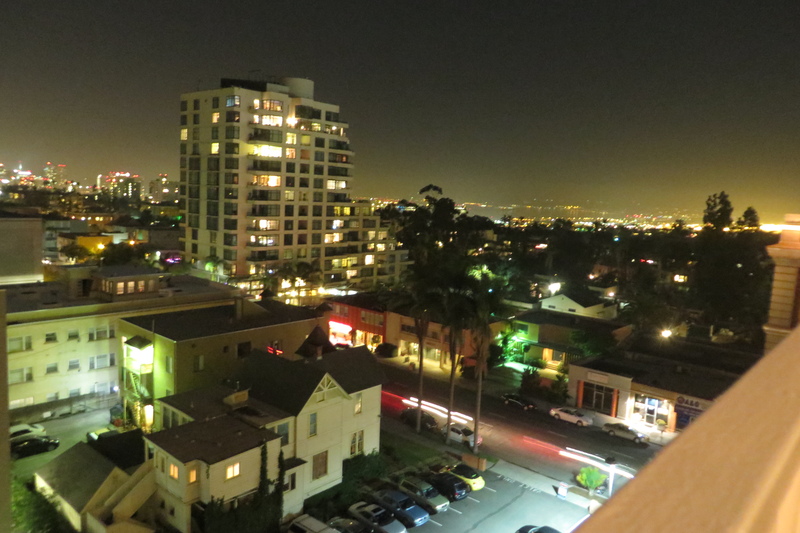 Admittedly, this party was a big part of what makes me say that my stay in San Diego was great! Big hellos and shout outs to Dave and (separately) Angelo who were my two favorite people that I met that night. 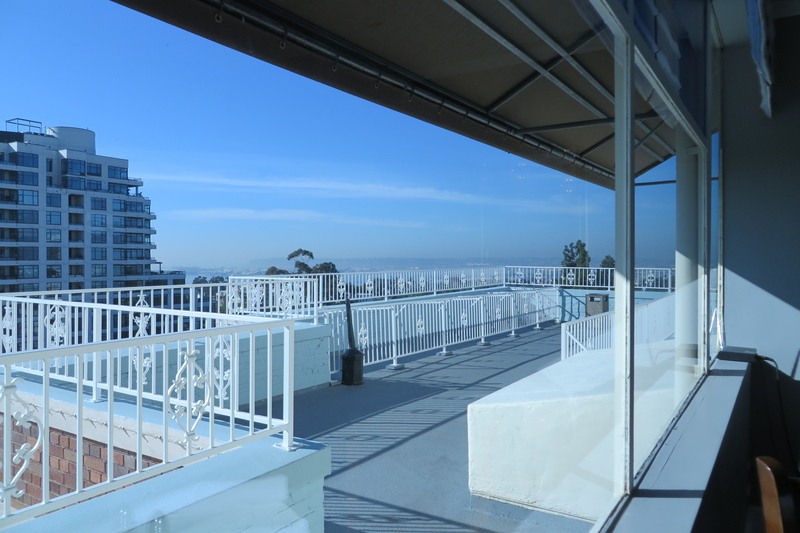 But here’s the thing about the Inn at the Park and its Friday night Happy Hour on the Roof – it’s ending. This month. January 31st will be the last of these top of the city parties. The men I met were melancholy about this fact, as could be expected. This party’s been going on for over 20 years, some said 25 years. What’s causing this tragic winding down of an iconic neighborhood weekly party? It’s the fact that The Inn at the Park has been sold to Wyndham properties and they will be turning the hotel into a time share property. And the roof? That will be converted into a fitness room, a sales center and an owner’s lounge. Some men were admittedly angry that their beloved Friday scene could be so heartlessly ripped from them; angry that a corporation could just swoop into their neighborhood and dismantled what they consider an institution. I have to admit it made me kind of sad too. This really was a splendid evening. It was a long-standing happening, important to the self perception of an entire generation of gay men in the area. I got a little drunk and I felt special to have gotten here to experience this fabulous tradition, this hotel, this roof top, these men, before the end. I didn’t even know the end was coming, but I managed to get here to see it in all its glory before it fades into memory. Mine. Theirs. And San Diego’s. 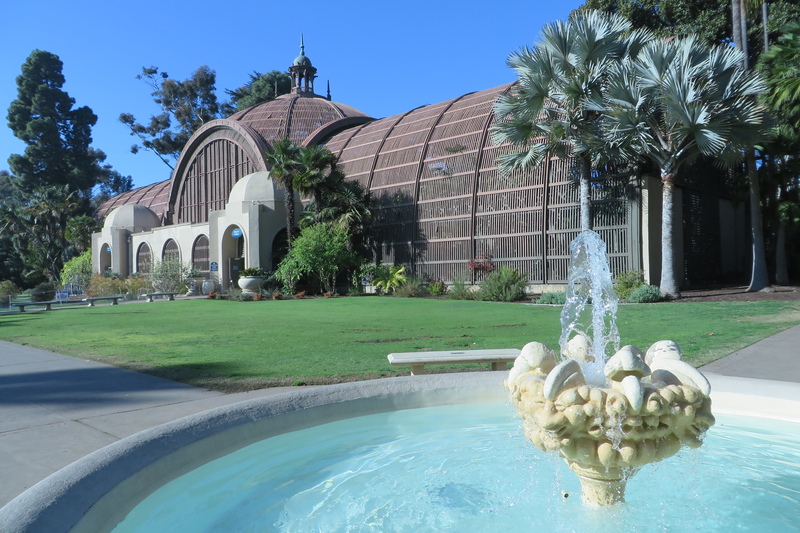 I’m not going to make this blog post much longer or I’ll never get it posted, and I’d like to end on a more upbeat note so let me give a shout out to some of the awesome things I enjoyed in Balboa Park. 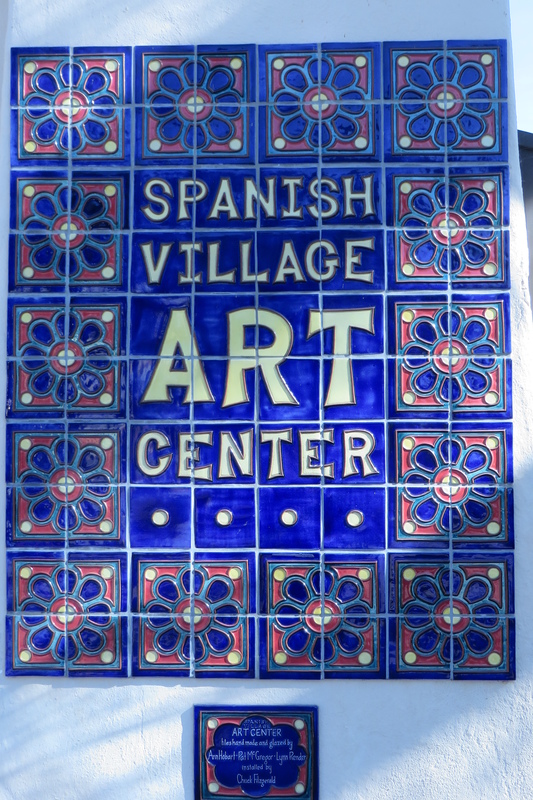 I loved the Spanish Village Art Center. And the Botanical Building Designed with a lot of input by our esteemed architect Frank P. Allen Jr.
And the special exhibit at the Museum of Man – The Instruments of Torture. 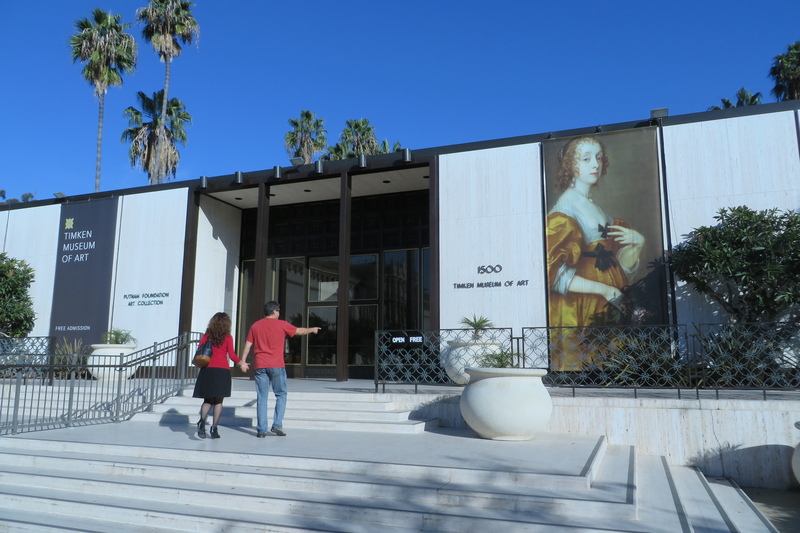 Oh and the Timkin Art Museum – small but very worthy. 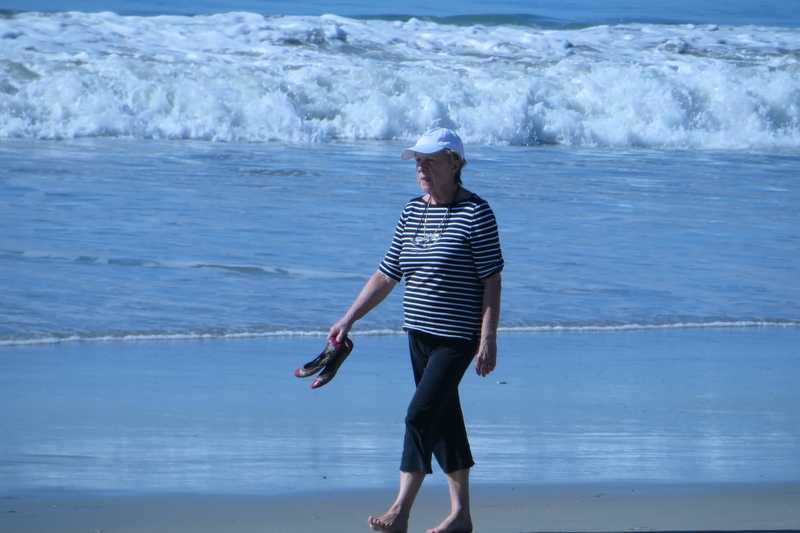 Maybe next visit I’ll actually check out San Diego…. 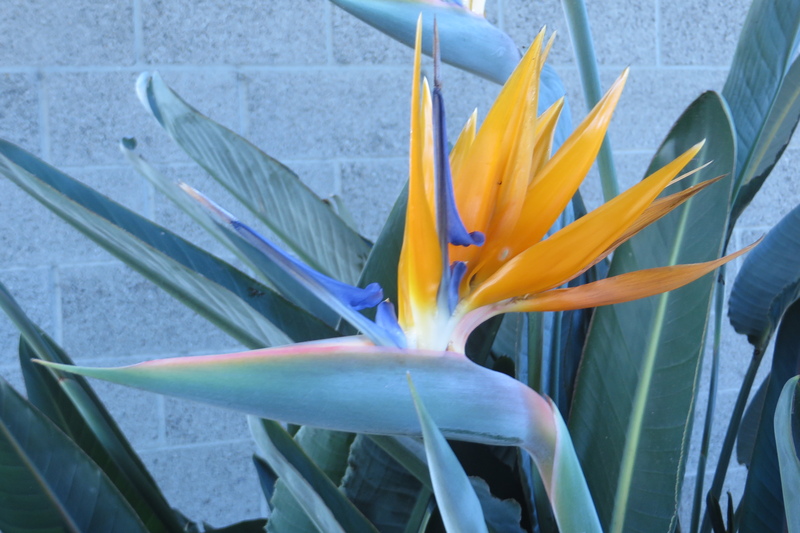 I should always see Birds of Paradise in my everyday existence. Ok. Ok. This is a place for truth. I have no concerned readers. It was actually my best friend who wrote and said that. I’m sorry to have given that impression. It wasn’t at all “the sadness of Tony” that stopped me from writing. It was, instead, a couple of other things. 1 – The sadness of Tony wasn’t really Tony’s fault. Nor was it overwhelmingly his sadness I felt. His was real and true. But what weighed on me so heavily was the town itself, the other energies and people there. Once I left, things got better instantly. 2 – It was that I’ve been quite busy. I’ve been on the move. Socializing. Seeing people and doing things. I’ve been to the Salton Sea, to San Diego, to Laguna Beach for a few days, to visit friends and their four adopted Chinese daughters in Hermosa Beach in a house bursting with activity and lined up lunch boxes every morning. I’ve been to gajillions of Museums, had dinners with friends, and wandered on beaches for hours on end watching strangers wandering on beaches, I’ve been contemplating the lives of shore birds and enjoying the weather immensely. 4 – I’m an active Toastmaster. I’m the VP of Public Relations at my home club. I promised to keep up my social media posting duties AND more interestingly, I’ve been visiting Toastmaster Clubs in some of the cities in which I have stopped. When I do that, I write a blog post for my club blog about their club, their meeting and my visit. So when I HAVE had time to write, I’ve been doing that first. Because it’s easier to write a report than it is to write something perfect thoughtful, and I’ve wanted to write those before the impressions fade. But now I’m mostly caught up on Toastmaster blogging. And as of late last night I have landed at a friend’s house with some peace and quiet, no need to jump in the car to move on, nothing particular to see nearby, and he’s off at work for the next 8 hours. So maybe I can work on this. Oh, and if you want to see posts about Toastmaster meetings – that blog is here: Cromwell Community Toastmasters. This morning feels so oppressive. Grey. Smog. Dingy southern California. The grey hides the usually shiny veneer. I feel my own mortality this morning. What with Tony being my age when he died. I feel the weight of millions of dead and dying dreams here. Tony’s included. Screaming children in the hotel parking lot. A young check out clerk with puffed up visions of her own importance. With her huge fake lashes and carefully contrived eyebrows that look scary, stark, as if they are planning an attack. The sad talk of the baristas at Starbucks in a dingy strip mall in the depths of all that’s bad about the edges of LA. She wishes she lived in Boston. The family pushing a week’s worth of groceries down the street, tiredly. He with the grocery cart a mile from the closest store and fully over-flowing. Her with the stroller, two kids. Dead dreams feel oppressive and they hurt. They press. 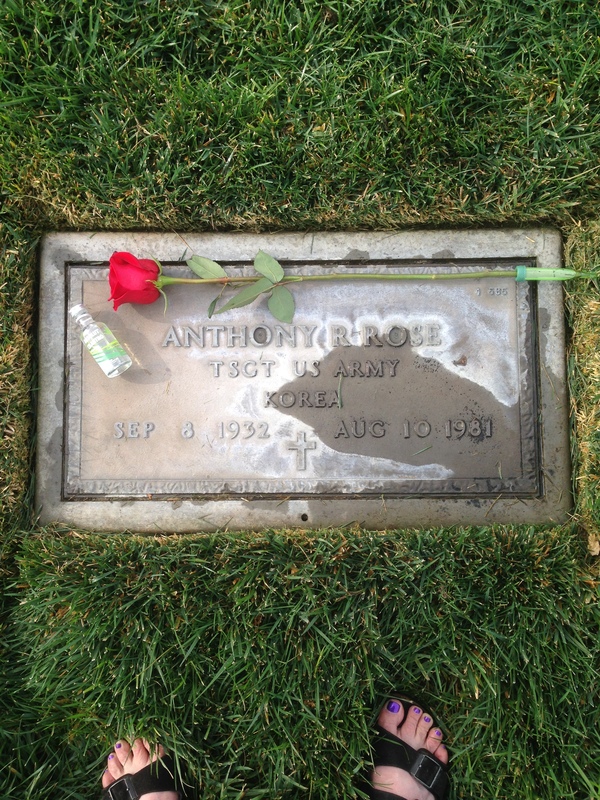 Here’s a rose for you Tony. And a drink. I need to get out of here before my dreams die too.